In the past 17 years, North Carolina has been hit by two storms causing 500-year floods. Hurricane Floyd in 1999, and Hurricane Matthew this past month. Both hurricanes caused extensive damage and loss of life. But Floyd in particular was especially devastating to animal agriculture and the environment. Floyd killed more than 20,000 hogs, and flooded over 50 hog manure lagoons. Following the storm, Environmental Defense Fund worked with others on policies that helped many farmers move out of vulnerable floodplains. We also successfully pushed for a moratorium on new or expanded farms without increased environmental protections. While the full extent of Matthew’s damage is not yet known, it appears that such policies helped. Current estimates place hog losses at 3,000. And as far as we can tell, fewer than 10 manure pits flooded. Losses of chickens, which are not subject to the same restrictions as hog farms, were much greater. By some estimates, Matthew’s floods killed 5 million birds. 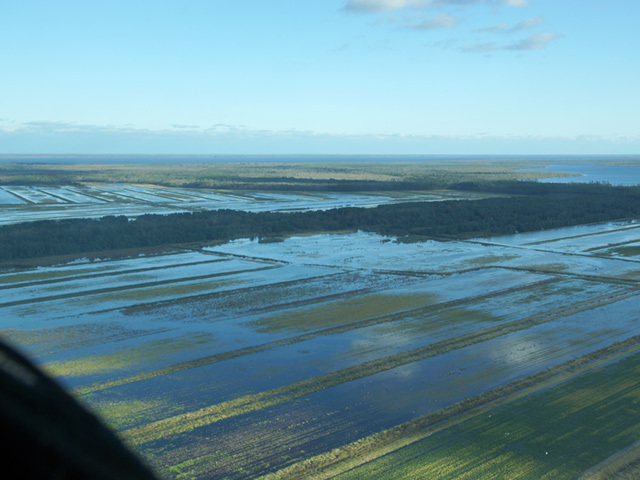 Farmers and their neighbors can agree that even one flooded farm is too much damage. Aside from the devastating impacts on farmers’ livelihoods, flooded farms also generate risks for the environment and public health. With extreme weather events occurring more frequently, we need to double down now on efforts to relocate both hog and chicken operations out of harm’s way, and we need to support farmers in this process. Some agriculture practices have it all – they reduce emissions, protect farms from extreme weather, and can even open doors to new sources of farm income. Improving manure management can hit all three goals. Most hog manure in North Carolina is stored in open pits, which release methane, a powerful greenhouse gas, and are susceptible to overflows during intense episodes of rainfall. By covering manure pits, a farmer can better regulate a lagoon’s water level. Better yet, farmers can capture the methane gas and generate renewable energy, either as biogas or electricity. Though covers require an upfront investment, the long-term payoff in reduced risk and a new income stream to the farm can make it pencil out. It is clear that the climate is already changing, but agriculture can help reduce the greenhouse gas emissions that are contributing to this problem. Agriculture contributes roughly 10% of U.S. greenhouse gas emissions, but it also has the capacity to reduce emissions and even store carbon in healthy soils and plants – often with practices that benefit farmers’ bottom lines. For example, crop farmers who apply nitrogen fertilizer efficiently can both save money and reduce emissions of nitrous oxide, another potent greenhouse gas. Another practice, conservation tillage, stores carbon in the soil, which makes yields more resilient to weather extremes. Farmers on the leading edge are increasingly recognizing that practices that are good for the climate are also good for their businesses. Finally, we need to look hard at our approaches to both preparation and response. Today, there’s a tremendous imbalance between how much government and industry spend on preparation and resilience – millions – and what we spend on recovery – billions. This is contrary to how every analysis suggests tax dollars be allocated. We know that for every dollar we spend to reduce the risk of flood disasters, we save $5 in disaster response and recovery. This is why we should require recovery spending to focus on making a flooded area more resilient the next time a storm hits. While the economic case for climate resilience is strong, the prospect of saving lives makes this even more important. 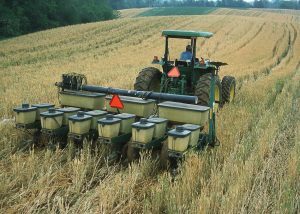 This entry was posted in Climate Resilience, ecosystems, Sustainable Agriculture and tagged chickens, extreme weather, fertilizer efficiency, flooding, floodplain, greenhouse gas emissions, hogs, hurricane, Hurricane Floyd, Hurricane Matthew, manure, no-till, North Carolina, nutrient management, public health, resilience, resiliency. Bookmark the permalink. Both comments and trackbacks are currently closed.